If you need to plan a bridal shower, why not consider a bridal shower tea party? Especially if the bride-to-be is a fan of tea. You can make it into a theme. Think specialty teas, whimsical and interesting tea pots and tea cups, even a cream and sugar bowl. Get the bride started off right with just the perfect tea set. Even if the bride-to-be isn’t into tea, you can still have a great bridal shower with a tea party. Tea parties just lend themselves to a group of ladies getting together to celebrate something as special as a wedding. Start with a theme, pick your invitations, choose decorations and then plan the menu. 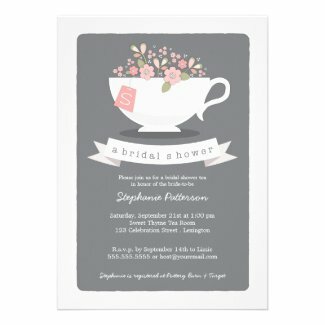 Any bridal shower will be a hit with a great tea party. You can pick any kind of a theme for your tea party. A formal afternoon tea, a fun humorous theme, even a romantic floral theme. Just about anything you can think of can become a theme for a tea party bridal shower. Match the decorations and food ideas to your theme. Appropriately shaped cookie cutters can create themed food. Use them to cut finger sandwiches along with cookies. Planning a bridal shower tea part be simple when you think of a theme. Once you pick your theme, find invitations to match, look for fun finger foods to serve, and get good specialty teas to serve. You can even decorate with extra teapots as your centerpieces. Simple teapots can be dressed up with fresh flowers laying on a colored cloth napkin surrounding the teapot. Imagine this charming floral teapot set on a navy blue napkin with miniature red rose buds tucked around the bottom. Simple, yet gorgeous. Remember, a full meal isn’t necessary for a bridal shower tea party. Try a sweets-only buffet for an easy change of pace. So plan your next bridal shower as a tea party. You will delight your guests. A bridal shower tea party – how delightful! I love the square floral vintage looking invitation. What a perfect theme that would make for the whole shower! Tea party themes are perfect for almost any occasion and a tea party bridal shower would be beautiful!